Outlander Season 4 Episode 4 Recap: "Common Ground"
Common Ground! That’s the title and the goal of Starz’ season four episode four of Outlander. Some of the title snippets that open each episode are very interesting, and this week’s intro particularly was to me. After the amazing Skye Boat introduction, there was a Cherokee putting on his regalia. Totally sets the mind in the right direction for this episode. Jamie (Sam Heughan) is in the office of Governor Tryon (Tim Downie) securing his land grant to build on Fraser’s Ridge as the episode begins. Jamie has a contract placed before him to sign to secure the grant, and having signed a mortgage document myself I get the internal feelings that go through you at that moment. Jamie’s had to have been even more acute in the knowledge that the governor would view him as his man and expect his service from that point forward. The term “signing your life away” would be very apropos just then. Naturally, the governor’s very pleased. He offers to make accommodations for Claire (Caitriona Balfe) while Jamie gets the settlement up and running. Jamie doesn’t even bat an eye before telling him that she will be assisting in the building of the settlement. Leave our Sassenach behind? Just try that and see what you get. The governor appears surprised for a split second and changes the topic to something of more importance to him: the men Jamie will find to join in on the Ridge. Those men will go with Jamie should the governor call for the militia. Jamie has a profound deal of experience, I’m sure more than the governor has, in understanding the hidden expectations of such an award of land. He walks out of the governor’s office clearly understanding what was said, and unsaid, in the conversation. Claire and Ian (John Bell) gather the rest of their things in Wilmington to take along with other provisions to the Ridge. Poor Marsali (Lauren Lyle) has a horrible bout of morning sickness and Claire gives her advice on how to deal with the nausea. However, Claire can tell something else is bothering her. (Marsali and Claire have come to an understanding along the way.) Marsali finally shares with Claire she misses her mother – not a friend to Claire to put it mildly. Claire reassures her it’s very natural to want her mother at a time of pregnancy. Marsali indicates she’s glad to have Claire’s support. 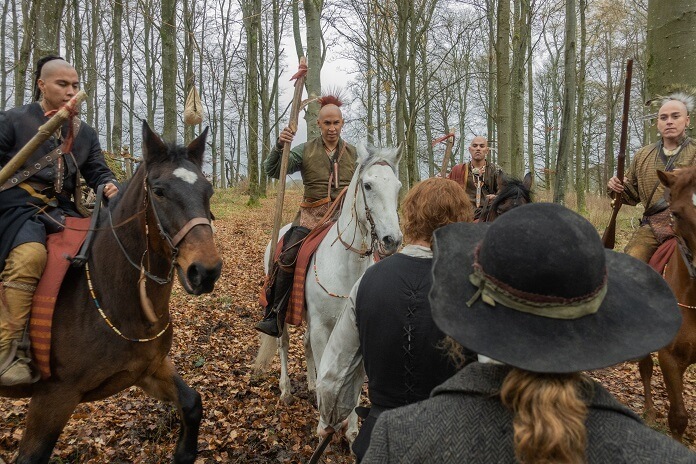 Jamie instructs Fergus (Cesar Domboy) to find other Highlanders for the settlement. Jamie and Fergus join Claire and Marsali to say goodbye, and Claire gives Marsali a motherly hug. As Fergus and Marsali depart the tavern, Jamie notices the look Claire gives Marsali. He knows Claire’s also thinking of Brianna (Sophie Skelton). Claire admits she’s worried that maybe it was wrong to leave Bree behind. She didn’t have a mother to lean on when she was pregnant with Bree, and Claire realizes she caused the same gap in motherly support to Bree by leaving through the stones to find Jamie. Jamie confesses to Claire how he managed to make it through the times when he missed her deeply. He says Brianna will get through those moments, too, by using the memories of Claire that she has. Into the back country of the Blue Ridge Mountains they go…to Fraser’s Ridge. The first task is to stake out the boundaries of the land grant. As they’re walking, Claire shares the “America” song and tells Jamie it took the melody from a British song, “God Save Great George Our King.” Jamie finds it funny they took the melody away from the British to use. They continue to walk and find the massive trees that Governor Tryon told Jamie are the farthest boundary to his land, and Jamie carves a F and R to indicate it’s the border. Ian manages to find a pile of animal leavings that are rather substantial. The trio muse about which animal left them. Claire is informing them of several various large beasts that could have made the pile of dung when Rollo suddenly starts to bark. (It made my dog bark at home causing the hair on my neck to stand for a second. Rollo has that effect, I suppose.) Claire freezes knowing that something’s behind her given the direction the dog’s barking and Jamie’s expression changing. Jamie walks up next to her and tells her to give him the knife she’s holding and get behind him. Native Americans could be extremely dangerous if they chose to be, and the Cherokee were one of the dangerous and reclusive tribes. In the book, Jamie and Claire’s first meeting with the Natives was after Jamie killed a bear with his knife and bare hands. He was mauled a bit in the process. Let’s see if we get to witness that particular grudge match. Jamie gave them the bear meat as a peace offering in the book, and thus a copacetic relationship began. Looks like the show could possibly take a different tack. Let’s find out. In the show, Jamie tells Ian and Claire to stay with the rifles and he walks out with open arms. He makes it a few steps away, drops his knife, and says his name. The Cherokee decide to turn and go. A rather unsettling beginning. In 1971, Roger (Richard Rankin) is in his office at Oxford looking over the book Brianna had given him at the Scottish festival. He notices a simple passage about some settlements in an area of North Carolina and it includes a reference to Fraser’s Ridge. While Roger’s reading the passage we see Jamie chopping down trees, Claire using the mule to tow them away, and Ian picking up rocks and finding a stray arrowhead under one of the stones. Roger looks at the back of the book to find how to contact the author for more information on Fraser’s Ridge. The book didn’t indicate the inhabitants specifically, just that it was settled by Scots. Back in the 18th century at the Ridge, Jamie’s talking about the lines of the house he’s going to build for them as he points it out to Claire. At that moment their shelter’s a lean-to that Jamie and Ian erected. Jamie indicates he even marked out a section for Claire’s herb shed. As Jamie’s straightening a post he used for marking the outer wall of the shed, Ian comes running down the path screaming that the Cherokee are back. Each of the party of Natives had grabbed a boundary stake and they throw them down in from of the trio. It’s a warning, but the Natives speak in their native tongue which, of course, Jamie, Ian, and Claire don’t know. Roger receives additional information from the author of the book about her research material from Fraser’s Ridge. In the packet’s a photo copy of the contract Jamie signed in the Governor’s office. Roger’s shocked and excited at the same time, and he decides to call Brianna about what he found. Awkward is not even the best description of the conversation. It’s the first time they’ve spoken since Brianna rejected Roger’s proposal. Other than the information Roger shares about her folks, the rest of the brief conversation’s painfully polite, short, and impersonal. That night at the Ridge after the Cherokee visit, Claire suggests they move the settlement to another part of the land. Jamie’s wise enough to extrapolate from what Claire had shared previously about her knowledge from the future about the Natives that nowhere on their land would make a difference to them. Jamie wishes he could communicate with them to let them know he’s not a threat to them and will not go beyond the borders of his land. Claire mentions that maybe a gesture of good will would help. Jamie believes that’s an excellent idea and is going to ask John Quincy Myers (Kyle Rees) about it the next day. That night Jamie’s roused from sleep by a barking Rollo outside the lean-to. Jamie suspects it’s the Cherokee again, and they arm themselves and go out to investigate what has Rollo so vocal. (Something struck me as I was watching. The dog tears off in one direction and Jamie, Claire, and Ian go the other way. WHY? Follow the dog, man! But I digress.) They find their meat provisions gone and other things broke or disheveled around the campsite. Suddenly Jamie’s horse comes limping into sight with four deep gash marks on its side. Jamie and Ian don’t know what beast could do such a wound, but Claire declares the intruder was a bear, not the Native Cherokee. Jamie visits Myers the next morning and tells him about the attack on their camp the night before. He agrees it’s not a good omen as the Natives see it. The Natives think the attacker was more than a simple bear and more like an angry bear spirit. Myers is drying meat and offers some to Jamie to take back to help replace provisions they lost. Jamie mentions his desire to make the Cherokee a gesture of friendship. Myers suggests taking some tobacco to them on Jamie’s behalf could help move things along toward peace. Jamie’s grateful and is going to heed the advice Myers was gracious to provide. Back at camp, Claire’s cleaning fish she caught while Ian mends the netting that one particularly large catch put a hole right through. Claire comments on how well Ian’s mending the net. Ian just chalks it up to being taught how to knit properly growing up. Claire’s very surprised to find that Jamie can knit, and quite well too. Ian’s surprised to find that Claire never learned to knit, so he promises to teach her. Ian heads away to check on the injured horse, so Claire decides to pick up the rifle and test her aim. Given the current situation, it’s best to feel comfortable with a rifle in hand. She’s firing at a small log on the chopping block when Jamie arrives back from Myers’ camp. Claire did well and knocked the small log off. Jamie says he thinks Claire might not have packed her powder well enough. He reloads and shoots the same log, splintering it into bits. That night Rollo alerts the trio again to something going on outside. Rollo finds a body in the dark under a nearby tree. It moans, and they all realize it’s human, not a bear. It’s a seriously-wounded Myers with gashes across his chest like the horse had from the previous encounter with the beast. The Natives are moving, with torches in hand, down a path. The Natives are heading to the den of the medicine woman, Adawehi (Tantoo Cardinal), for a ritual. Jamie helps Ian and Claire to get Myers back to their camp so Claire can treat him, and he’s losing a lot of blood from one specific slash. Jamie sets out alone after the beast, much to Claire’s dismay. What Jamie finds in the dark is much worse than a bear. Simultaneously while Jamie’s chasing down what he believes is a bear, the Natives continue with their ceremonial dance. Jamie fires his gun but misses. As he’s reloading, the beast approaches and attacks. Claire’s inspecting the wounds on Myers and notices he’s not only slashed but bitten. The bite was made by a human, not a bear. The beastly man slashes with the claw he’d fashioned as he’s covered in a black bear skin. He gets Jamie in the shoulder. As they struggle, Jamie manages to get free of the hand-to-hand combat. As the beast-man gives chase, Jamie impales him on a land marker stake, killing him almost instantly. At the same moment, the Cherokee medicine woman gives the impression she could either see or feel the situation that occurred on Fraser’s Ridge. The next morning Jamie uses the beast-man as his offering to the tribe. He puts the man on a manufactured skid and drags him to the Cherokee village. Jamie drops the skid and raises his hands in surrender. He shows the tribe it was a man, not a monster. Tawodi (Will Strongheart) speaks English and explains they knew the man and he was exiled from the tribe. In the book, some of the Indians spoke broken French which was how Jamie could converse in the early meetings with the Natives. Jamie assures them he only desires to live in peace and make his home. The Cherokee are skeptical of the white man but seem as if they’re willing to give Jamie the benefit if a doubt, given that he rid them of a problem by killing the beastly man they’d cast out. The tribe medicine woman, Adawehi, approaches Claire to inform her she had a dream about her. She knew Claire’s a powerful healer before she met her. She tells Claire that when she’s grey-haired, she’ll be an even greater healer. Adawehi also tells Claire that death was sent from the gods and it would not be her fault. Those of us who’ve read the books know what this statement means, and for the show viewers it’s not what you think. I won’t give any spoilers other than that. Claire doesn’t understand at the moment, but she’ll come to know the meaning in the future. Roger’s back at the manse gathering the rest of his things and has a last chat with Fiona (Iona Claire). Fiona admits she knows where Claire really went. She thought the loss of Claire must have taken a toll on Brianna. Roger admits that even though he and Brianna had a falling out, he still wants to give her some reassurance that Claire found Jamie. Fiona has more news to share on the topic and pulls some of the old research papers out that tell Roger the rest of the story on Fraser’s Ridge, or at least Jamie and Claire. She found some information of an obituary that Jamie and Claire were killed in a fire. The date was smudged so Roger couldn’t tell exactly the year but suspected it was 12 years from the time period Jamie and Claire were in just then. He’s distraught by the news and realizes Brianna will be devastated. Roger feels he can’t give Brianna that part of the tale about her parents. Back at the Ridge, life’s moving forward with each chop of an ax and pull of the saw. Jamie gets the lower outline of the house in place, so he carries his bride over the new threshold. They speak of their dreams for each square inch of the cabin. Shelves here, table there, fireplace hearth in that corner. They sound like newlyweds instead of a couple having been married 24 years. Slainte to the new cabin and peace with the Natives! Roger decides to call Brianna but Gayle (Simona Brown) answers instead and has some surprising news: Brianna headed to Scotland to visit her mother a few weeks ago. Roger’s stunned because he knows what that means. If you watched the preview of the upcoming fifth episode, that means Brianna’s heading for the stones.